The drama surrounding Justice League getting onto the big screen has been nearly as prevalent as the general anticipation for the superhero film itself, if not more so. Major issues obviously drew attention, from the replacement of the director late in production -- due to tragedy -- to the considerable reshoots that followed, so significant that discussions were had about proper directing and writing credits. Comparatively minor concerns may have been overshadowed by the bigger ones, but their existence just added to the theatrics: a digitally-removed mustache, a lackluster costume for a superhero already well-realized on TV, and whether one of the actors will continue playing their role afterwards. And, of course, there's the general perception of the universe within which this film exists, including several blockbuster outings which have been negatively received by both the critical and audience communities. Amid all this, it wouldn't be unreasonable to have zero clue of what to expect from such a messy, affected production, so perhaps Justice League should be commended for merely showing up and being a passable form of entertainment with brighter tones and personality. A good movie that doesn't make, though. Trepidation towards this rendition of DC's iconic team-up of superheroes emerged almost as soon as it was announced, since half of these heroes hadn't really been introduced to the universe, aside from fleeting glimpses at surveillance footage from Batman v. Superman: Dawn of Justice. It's hard to argue that Zack Snyder -- and replacement director Joss Whedon -- had a difficult task ahead: establish a trio of new superheroes of almost the same caliber as Batman, Superman, and Wonder Woman; create a threat big enough to bring them all together into a league; and then, y'know, deliver a blockbuster experience that utilizes their combined superhero capabilities. Top that off with trying to maneuver around the (spoiler alert!) death of Superman from BvS, and there's a lot that would need to happen even within a three-hour span of a movie. The challenges don't stop there, though, since a mandate somewhere in the studio pipes wanted this thing to be right at two hours in length. Unfortunately, the awkwardness of storytelling in a rush can be observed from the first encounter in Justice League, in which Batman (Ben Affleck), who had only engaged Superman and Doomsday as supernatural threats prior to this, engages a winged creature that glows orange and sports gnarly teeth. Affleck once again embodies the physical presence of the Caped Crusader better than one might expect, but the abrupt introduction of this winged creature and the character's deduction of what's entailed by this thing's appearance in Gotham City starts Justice League on a strange and manufactured note. It's the arrival of other-worldly threats that Batman won't be able to combat alone, yet the limitations of the script force the detective to hurriedly prepare for a certain invasion instead of preemptively organize a team to fight against enemies out of his human element. The distinction isn't so subtle; it's the difference between crafted, deliberate writing with subtlety and personal development to work with and forcing a scenario into existence that starts a countdown and demands for superheroes to band together whether they like it or not. This begins Batman's travels across the globe to recruit heroes that may be able to stop such an invasion, which also starts the unveiling of new characters in Justice League. Surprisingly, and to the credit of both directors, none of ‘em lacked the breathing room to take shape as authentic heroes. 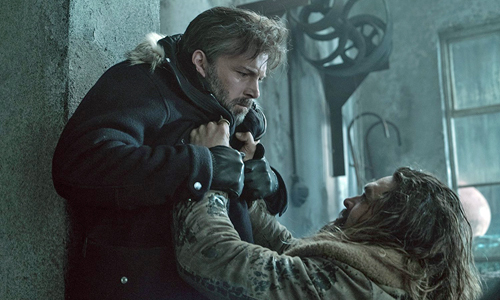 Jason Momoa's windswept appearance as Aquaman taps into both his hard-living lifestyle and the mythology behind his "talks to fish" character, eliciting just enough modern gristle and just enough Khal Drogo for the part. Ezra Miller adds comedic relief -- and a bit of narrative smoothness with his enthusiasm to join the group -- as swift-moving Barry Allen, who also possesses a fine degree of emotive back-story involving his incarcerated father (Billy Crudup) and his limited heroics as The Flash. Perhaps the most surprising, however, is Ray Fisher as Cyborg, whose story of transforming from a high-school football player into a half-machine constantly learning about his abilities directly ties into the end-of-the-world devices of the story, and his melancholy presence works well with the team. Gal Gadot is stunningly charismatic as Wonder Woman, but after Patty Jenkins' film from earlier this year, that's to be expected. The death of Superman also plays a key role in Justice League, of course, and every indication of the tone and intentions of this film -- the first time this storied group has arrived onscreen -- points to that narrative thread arriving at a predictable and poorly-hidden resolution. Cavill's Superman becomes a bonding agent between the starkly different heroes, a shared commonality between them all that urges them to be more than they currently are. The events of Batman v. Superman also have a unique impact on Bruce Wayne and Diana Prince (the real-world aliases of Batman and Wonder Woman, of course) as evolving heroes, emphasizing Bruce's hollowness as an aging mortal with grief issues and Diana's lack of putting herself out as a beacon of heroism for other to latch onto. Thematically, the ways in which the characters interact with Superman's legacy and the need for him to fight alien forces adds some much-needed positivity to the tonality of the DC universe; however, the byproducts of those feelings and the methods in which the script tinkers with resurrection drag those down with comic-book ridiculousness. Certain events needed to happen, though, and at least the script unearths some interest while doing so. 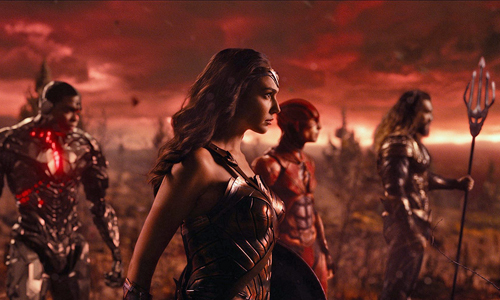 Fleshing out these new characters and reemphasizing the gravitas of the others may have been a crucial victory for Justice League, but it's only one piece of the puzzle needed for this to elevate into a worthwhile superhero outing, and the other components accomplish little beyond keeping the film moving. As the antagonist, there's Steppenwolf, a horny-helmed and axe-wielding warrior whose computer-generated presence never stops reminding one of countless other villains; it doesn't help that he's the second of such mythical helmeted baddies delivered by DC this year. He's in search of MacGuffin-esque "mother boxes", a trio of cubes that, when combined, can -- gasp! -- lead to the destruction of Earth. The blend of Steppenwolf's hollow backstory involving his thwarted ambitions and the almost Lord of the Rings-like disbursement of these boxes take shape as the epitome of mandatory superhero motivation writing, revealing little ambition behind the moving parts of the monumental threat bringing the heroes together. The lackluster elements of Whedon's Avengers manifest here, and who knows whether that's the doing of Whedon or the simpler direction that the film would've taken regardless. 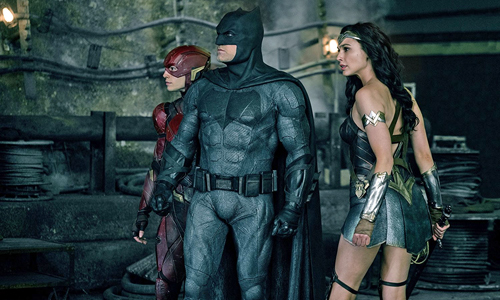 What happens once Justice League finally arrives at its bursts of action revolves around the teamwork of the heroes and the strength of the evil they're taking down, resulting in bold set pieces driven by levity and charisma against a swarm of semi-faceless creatures and a dud of a mastermind behind it all. Snyder's traditional slow-motion pops up infrequently here, this time strategically implemented to boost and accentuate scenes that benefit from the slowdown, especially involving The Flash. Sprawling visual effects capture the lightning bolts, the radiating cybernetics, and godly flashes of energy with a lot of excitement, but the rendering of the buggy-winged creatures and of Steppenwolf's towering frame lends artificiality to their combatants. Grim reds and browns are interrupted by vibrant bursts of blues, greens, and purples amid the action, brightening the color palette in ways fans have been asking for a long time. Yet, the condensing of all these components, despite fresh instances of the universe not taking itself so seriously, still yields a washed-out, forgettable climax for this long-awaited uniting of DC's superheroes.